Although many things around us are made up of covalently bound stable molecules, their properties are dictated by weak interactions among them. The manifestation of such forces is evident from the deviation of the ideal gas behavior of so called noble gases due to van der Waal’s forces on one hand and the variations in their physico-chemical properties due to hydrogen bonding on the other. Many of naturally occurring processes that occur at STP are also controlled by weak intermolecular forces between them. At more complicated level these forces play important roles in imparting structures to various biopolymers and also enable them to carry out many functions in living organisms under ordinary conditions that keep the biological systems ticking. These forces include electrostatic, polarization, dispersion, covalency. Hydrogen bonding interaction that is all pervading is composite of all these fundamental interactions. Hydrogen bonding interaction involving the first row elements such as oxygen, nitrogen, and halogens has been very well studied. However, the H-bonding is not limited to these elements only. In recent past many novel H-bonding interactions have been discovered. The most important of these include CH and SH groups as Hydrogen bond donors and sulfur and carbon atoms or aromatic rings as H-bond acceptors. Some of these interactions also show unusual characteristics, e.g., the hydrogen bonding interactions in which CH acts as H-bond donor the CH stretching frequency actually shows a blue shift rather than the conventionally observed red shift. Besides, the structural data of many proteins indicate that the CH—Pi contacts constitute a large fraction of intermolecular interactions responsible for their structures. Within the Chemical Physics and Dynamics group we have been investigating the novel hydrogen bonded systems using Supersonic Jet Spectroscopy. Supersonic jet expansion cooling method is used to form the weakly bonded clusters in the gas phase. These complexes are probed using a variety of laser spectroscopic methods in the electronic ground state, the first excited state as well as in the cationic state. Electronic excitation spectra of monomer and clusters are obtained by laser induced fluorescence (LIF). Similar information is obtained in mass gated channel by two-color resonantly enhanced multiphoton ionization (2c2p-REMPI) coupled with time of flight mass spectrometry (TOFMS). These two techniques provide the information about the S1 state. Disperser fluorescence (DF) is useful in order to obtain the information of S0 state. In this technique, the molecule is excited to a specific vibrational level in the excited state and the total fluorescence emission is dispersed by a monochromator. To characterize hydrogen bonded complex in the cationic state, zero kinetic energy (ZEKE) spectroscopy and mass analyzed threshold ionization (MATI) techniques are used. The sample is excited to the high lying Rydberg states. Thereafter the Rydberg states are extracted by applying delayed pulsed electric field which is also known as field ionization. Usually intermolecular vibrational modes are identified by comparing the Excitation/DF spectra of monomer and the complex. The important information about the changes in the vibrational stretching frequencies of H-bond donors (e.g. 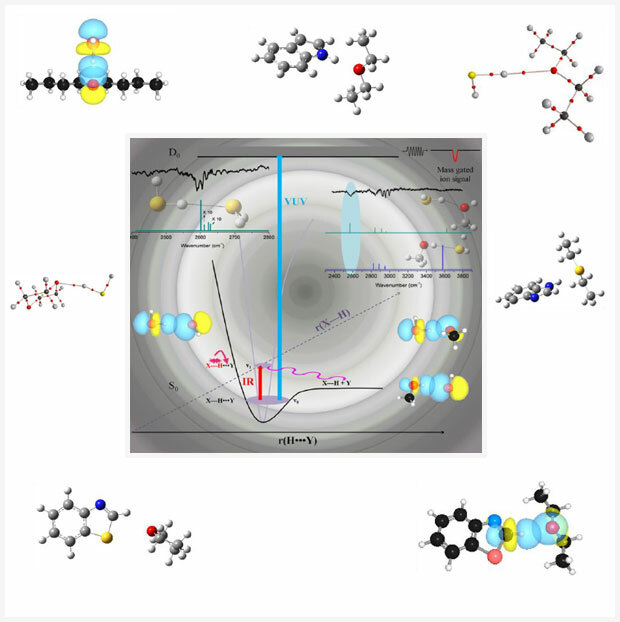 O-H, N-H, SH, and C-H) upon complex formation is obtained by IR-UV double resonance spectroscopy. These are determined by resonant ion- dip infrared spectroscopy (RIDIRS) or fluorescence depletion IR spectroscopy (FDIR). In these methods, vibrational excitation is carried out by IR and the depopulation of the ground state is observed by electronic transition. Usually the experimental data is complemented by theory and computations. Ab initio computations such as geometry optimization and frequency calculations are performed using the Gaussian09 suite of programs. Additionally, quantum theory of atoms and molecules (QTAIM), natural bonding orbital analysis (NBO), localized molecular orbital energy decomposition analysis (LMOEDA), and natural energy decomposition analysis (NEDA) are also carried out in order to get more insight about the nature of H-bonding interaction in the complexes. More information about our methods and activities in this area can be found here.